What's the idea behind Curzon Home Cinema? It's a virtual venue, a virtual Curzon cinema. A destination for you to watch new releases that are also playing in the cinema, in a legal way. Premium VOD. Simultaneous releases of films is what we're advocating as a venue. So, in all of the trailers, all of the adverts, it's all about simultaneous, day-and-date releases. It's about taking the cinema to people. Were there ever concerns about the impact this strategy might have either on cinema attendance or DVD and Blu-ray sales? Absolutely. Yet we're building two, three new cinemas per year, so as far as the impact on the cinema goes we don't believe it. We're actually growing audiences. Look at 45 Years, which was our most successful day-and-date release yet. A lot of that was regional audiences, so we simply didn't feel that supposed cannibalisation of cinema audiences. It's about picking the marketing strategy to deliver the film to people who don't have it because it's not playing cinemas in their area for whatever reason. It's expensive to come to the cinema. We're all time-poor and all those other reasons why. But what we're saying is 'Don't stop engaging'. It's free to sign up, it's discretionary, there's no long-term contract. You can come in and buy a day-and-date film for £10, but you can also buy a £2 film; there are various prices in between. So price isn't the issue. We curate stories, we suggest programming to you and we change the line-up to showcase Curzon Artificial Eye's library. So the upside for them is they get their product seen in 6.5m homes in less than two years. We're about to start releasing pre-rolls ads at home and they'll mirror the pre-rolls here at the cinema. One of the parts of cinema I always remember as a child is you go in and the last thing you see before the film is that black BBFC board with the scribbled signature. Well, they've created a bespoke one for us. So, we'll have a pre-roll and after it, the last thing you see before the film starts will be that BBFC card. It's mirroring the cinema experience. While we can't mirror the shared experience you get in a cinema, we can mirror some of the experience. And that's the difference, some of these little nuances that I think are important. How do you measure the success of 45 Years? I can't give you exact information numbers-wise. From our point of view, it beat our previous best by kind of two, three hundred per cent. Sixty per cent was regional. Theatrically there were over £2m in box office. It started at 60 venues when it opened and grew to over 100, so the growth in cinemas showing it across the country went with our streaming growth. And it had a very long simultaneous window. That's the important thing: we're not advocating getting rid of theatrical windows, we just believe in shortening them, but also simultaneous. So there's choice. If you go to Curzon.com, the first thing you see is half of the page asking if you want to go to the cinema to book a ticket or see what's on, while the other half asks if you want to go to Home Cinema and watch it right now. If someone is in North Norfolk then their nearest cinema is in Norwich, maybe King's Lynn. They're in the middle of nowhere. Can they watch any of these films? I grew up in Wales and there's not that much choice around. Multiplexes probably won't touch these films. So therefore these things don't get shown. Even something like 45 Years, the multiplexes didn't touch it. Now that's just silly. That's why this whole thing is a bit strange. We're seeing the tide shift. It really is shifting and, I imagine you know this, Sean Parker in the US is talking about a streaming day-and-date service. It's happening. And we've been doing this since Curzon Home Cinema launched in 2010 and have seen that people are willing to pay for premium content. It's worked very well for us so far. What's the response been from other distributors regarding day-and-date releases? Have they become more accommodating to the idea? That's a good point. More accommodating is exactly the way I'd put it. At the start it was pretty much just Curzon Artificial Eye and we were going out, and still do, buying films for day-and-date releasing. But more distributors are realising that they're buying films and just not getting screen space using the traditional method because the multiplexes won't support them, especially the smaller independent films. Even the bigger films, we're generally seeing a lot more failures. You keep hearing about another flop and another flop. And the point is, everyone's trying to find out what's the best model, and day-and-day allows you to efficiently market and promote. What sort of customers do you get? Some just want to come for the curation. But one interesting fact I can give you: 30 per cent of our base are buying four or more films a month. We have some people buying 20 films. That's a material part of their media consumption. Out of anyone's pay packet each month, that's quite sizeable. And this is not Amazon, feeding, feeding, feeding CRM (Customer Relationship Management) and getting you to buy things. 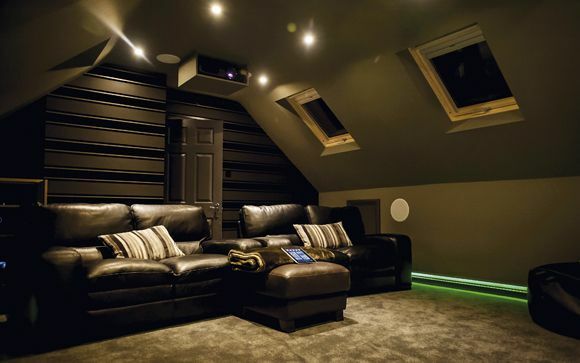 This is Curzon Home Cinema and they're coming to us. We're conversing with them through programming and whatnot and they're buying that many films. You're available on BT and Virgin Media's TV platforms, but not Sky. Are talks ongoing to change that? Absolutely. We've talked with Sky for many years now. Actually, back in 2008, our first day-and date releases were with Sky. We showed the films in our cinemas and they released them on pay-per-view. So the Sky conversation is ongoing. But you know how it is, Sky is Sky and wants to do its own thing in its own way. But that's almost what we don't believe. We don't believe in white-labelling. The value is actually Curzon being there; this cinema company making this digital cinema message. That's what we believe in and it's not a vanity thing. Otherwise it just becomes another digital product with a sticker on it saying it's in the cinema. No, Curzon is saying this is available now, in its cinemas and nationwide through Curzon Home Cinema. What proportion of purchases on Curzon Home Cinema are premium day-and-date titles as opposed to catalogue titles? It fluctuates depending on how many releases there are, but if it's from a consistent month, from a revenue perspective, it's a large part like 50 to 60 per cent. And if a day-and-date film is a user's entry-point, that's great. Being completely honest, some people are price sensitive. £10 is the average ticket price for a Curzon film across the country, obviously London is slightly higher, and that's why we charge £10 for a day-and-date film. The same film may be available currently on iTunes for £5.99, but we're a cinema company, we're not in a price war here. We're actually a destination. It's a brand trust war – and we want those consumers who want to come to Curzon. With regards to catalogue titles, how important is the curation of the collection and creation of collections to the service? Hugely. I think the important piece, again, is that we have a lot of talent come through the cinemas and we get them to curate collections for us. And you're about to see that change even more aggressively in the next few months. The important bit about collections is storytelling. I've got Sky at home and you can see a lot of these collections that appear, but they tend to be dependent on the release of something, so there might be a Bond collection because the new Bond movie has just come out. We're doing a lot more broader collections. And that might be a Cult Film collection, it might be a British Isles collection, but then we also have variance in between. So, we had a South American collection when the World Cup was on as South American football was quite prominent. Every Monday we pick one film and send it out saying this is the film we're talking about this week, because of this reason. It might be an anniversary. It might be a celebration of someone's life who has passed away. But it also may be something quite topical. Why was the decision made to use a pay-as-you go method? And what benefits do you think it has over a subscription model? It's the model that most replicates the experience of coming to a cinema: I'm going to the cinema and I'm going to buy a ticket to see a film. So when you're talking about day-and-date releases you're talking about an individual purchase. Now, I get asked the question about SVOD all of the time and, in my personal view, people have subscriptions everywhere because nothing's consolidated, and it's getting to the point where a large part of their outgoings are on these subscription services. So I think there's going to be a shake-up in the industry, they can't all sustain themselves. Business models are under threat. Not to say that I won't ever do SVOD. Going to the cinema is the same. We'd love everyone to come every night, but we know it's not possible. But when you do go out, you go for dinner, you watch a film, it becomes a value-add experience. The same is true for the digital experience. People say they'll watch a film because it's a new release, watch it right now at home, but then I don't want them to stop. I'd rather they come back and watch a £2 film next and still engage with the service. And that's the point of difference: a discretionary nature and no commitment. How many film titles are available on the service right now? It's around 750. It fluctuates depending on curation. And is that capped or is it a constantly growing library of titles? That's it, that's the cap. There's always two arguments: do we want to cut it further and there's always the element of choice. Sometimes, the new releases, there's a swell of them and we don't need so much library. It just depends. I keep on saying to the programming team that I want to keep it around the 700-750 mark. Given what's generally been regarded as disappointing sales for catalogue titles on Blu-ray, do digital platforms like Curzon Home Cinema offer a better way of getting these films to a wider audience? It's better to have them engaging with a product – I say that from a group perspective – than just for them to turn away completely. There are some DVD titles that just fly and they always will, regardless. Therefore, if those start to decline, the rest of the model fails because the business has failed. So what we're trying to do is ensure the future. And Curzon Artificial Eye has a very loyal DVD customer base. When the next boxset is announced there will be collectors who'll be saying 'I'm definitely getting that'. You only have to go past FOPP or something and you see that they feature Curzon Artificial Eye quite prominently because they know a large part of the customer base is coming back for that product. Is all content on Curzon Home Cinema offered in HD where available? Everything's HD. Everything's 720p. We're about to probably upgrade. Keeping up with the Joneses is a bit hard. People expect us to deliver an experience like Netflix, Amazon and iPlayer, and I monitor nearly every live chat that comes through. People just expect it to work. They've seen Amazon or whoever on the television, advertised amongst The X Factor, they expect us to be delivering a service comparable with that. Now I expect so, too. If I didn't I shouldn't be here. It's challenging, in a sense, resource-wise. But the point of view of that experience, of getting people on to the platform, is working well and we're about to launch a new app on Android and iOS – we already are available on iOS, on Android we're not because of the security issues – but for us it's opened up new audiences. We have applications on Amazon Fire TV, Virgin Media, Samsung Smart TV and even Freesat. But keeping those apps going and keeping updated and security updated, it's the resource that goes. And I have people quoting to me how it's their legal right to watch it on whatever device they wish. Obviously I wish it was true; it's not. How do we get those customers to come to another place to watch us? As a whole we start moving to more exclusive content as a group. You'll see that very soon. And that exclusive messaging will come as some sort of… You know, we'll start doing exclusive Q&As for example. We start making Curzon this destination and if people can't see it on another platform then they will come to see it with us. Moving on to audio then, are you offering 5.1 soundtracks where relevant? With BT we're starting to supply, because it's their platform and technology, so we're this brand of experience on BT. With us, no, it's stereo right now. I'd say, and I keep on talking to Dolby about this and they're trying to release a lot more soundbars that now have Dolby Atmos, but the problem is half of the products don't have Atmos sound, so it's just this thing that customers can't really benefit from. But soundbars and things like that are a lot more accessible now. Wireless speakers. Before, you would have to go to a retailer and spend a couple of thousand pounds to have a home cinema but the lion's share wouldn't. So, therefore, we're kind of... are we building something that's just not really that big in size? Again, whatever the cinemas do, I'll try and replicate. Dolby Atmos is only really just getting going. So is it worth us going to Atmos? Those conversations are happening right now. Dolby 5.1? It's just a matter of time. Live events have become more and more important to independent cinemas. Do you see a way that these can also be used to benefit the Curzon Home Cinema platform? Most certainly. We'll be doing a live event piece later this year, a Q&A out of the Curzon Soho. These debates sell-out in their droves, they have great topics and live event cinema is big. So putting them into cinemas is so obvious. We already do ballet and operas and whatnot. But you almost have to go to a cinema to watch them. Why not let people watch it at home? It will not kill the audience for this. Because to get a ticket for the Royal Opera House or whatever it may be? You can't get them for love nor money. But then all these people are denied access to this content. So what we're trying to say is: we'll show it in the right way, in context. I don't mean we're going to do One Direction or anything like that. No, no, no. But the right type of content… Culture. We're moving into the cultural space, definitely. The Curzon Home Cinema experience has evolved since its launch in 2010. Where do you see it going in the future? What are your ultimate ambitions? Very nice question. I want more distributors involved. We're having those conversations and I'd love those to come to fruition. Day-and-date is not this dirty word, it becomes this real thing. I want us to be this place where we're trusted and we're desired by the industry and the day-and-date isn't the limiter on a film's release – that's not fair. Actually, if a film goes day-and-date it shouldn't be an issue, it should just go day-and-date. The other thing is that we take it internationally. We're getting the model right. We've had many conversations. We've put millions of pounds into this and we've learnt a lot along the way – some good and some bad. People ask ‘How do you do that?'. Again, it's the link from physical to digital, how do you get that right? Just having a digital platform internationally won't work. You need the bricks and mortar piece. Who is that person? Can they do it? We believe we've got the model right now. We're at the point. We just want those distributors to come on board, to fruition, and then we go internationally. That's always been the strategy: to get it right and then it's scalable. It's entirely scalable. The Curzon Soho cinema on Shaftesbury Avenue is threatened with demolition as part of London's Crossrail 2 development. Want to get involved in trying to save a West End institution? Click here and sign the petition.